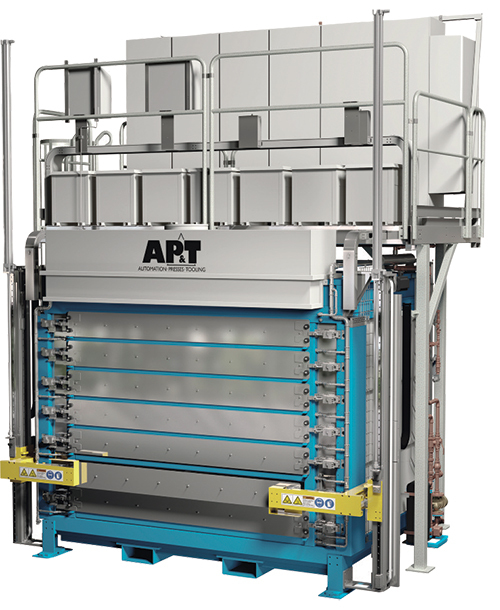 AP&T has launched a new generation of its Multi Layer furnace (MLF) for press-hardened vehicle parts. Introduced three years ago as a space-efficient, flexible and easily serviced alternative to conventional roller-hearth furnaces in press-hardening lines, the improved furnace now is equipped with a new control unit for more secure power supply. Also new: sensors that give better control over heating; a more rigid hatch installation; and sturdier heating elements. In order to prevent hydrogen brittleness, the furnace is equipped with dew-point control. The result is an optimized solution that meets demands for process stability and that satisfies car manufacturers’ CQI-9 standard. Compared to conventional roller-hearth furnaces, the MLF requires half the floor space. Parts to be heated can be positioned with a great deal of precision, which facilitates, for example, handling during concurrent production of different types of parts. And, if there is downtime in one of the furnace modules, the others can continue to be used as usual; a stoppage in a roller-hearth furnace means the entire process suffers. Lastly, since MLFs only have a few moving parts, service and maintenance is simpler and less expensive to perform.